Meet Clare & Josh! We first met Clare online through a few different photography groups! She is the amazing photographer behind Madeira Creative and back in February, she did some in-home portraits of us before we moved into a new apartment! 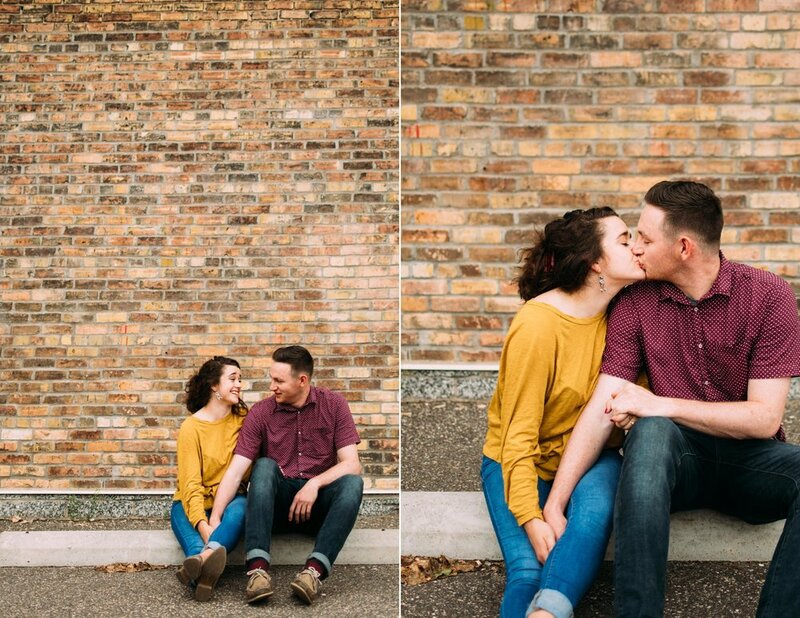 We're so happy to return the favor of a session to Clare & her fiancé. We've got beautiful greenery & beautiful garage doors? If you've looked through other blog posts, you no doubt know we love anything green. But we're also huge fans of architecture and the little nitty gritty places you stumble upon when you wander around the city. Also, Northeast Minneapolis has a store called i like you. It's home to cute knick knacks and a lot of adorable Minnesota-branded items (which we're big fans of). On one of the exterior walls of their building, they have this big "i like you" wall! It's a pretty common place for people to take photos, so I figured it would be cool to include an iconic Minneapolis location in Clare & Josh's urban adventure. Anybody else love empty parking lots? Guess what's not pictured in the set of photos below? A dead squirrel - pretty gross, but the photos still turned out pretty dang cute!